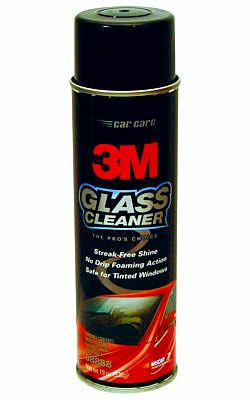 The 3M Glass Cleaner is an easy to use aerosol based cleaner for all glass surfaces including windows, windshields, mirrors, and side glass. Easy to use, quick acting and non-streaking. Removes fingerprints, oil and grease. May also be used to clean automotive vinyl, interior plastic, clear plastic, lexan plastic and also great on chrome or metal. The 3M Glass Cleaner is non-flammable, and will not affect painted surfaces. Contains 19 fl. oz.